For many people diagnosed with cancer, there’s little they can control about their disease. But health care professionals and app developers are giving cancer patients some command of their lives by providing applications for mobile devices to help them manage medications, track side effects and locate clinical trials, among other resources. These tools also give you a way to take control of your time, passing the long hours sitting in waiting rooms, undergoing chemotherapy or recovering in bed. You can take ownership of this time by connecting with communities, celebrating progress, getting creative and fighting boredom. Try using CaringBridge to create a website and share your story with options of making it public or private. It has a function that assists you in personal fundraising, so friends and family can show support financially. Set up your site with them at home and access it any time through your mobile device. 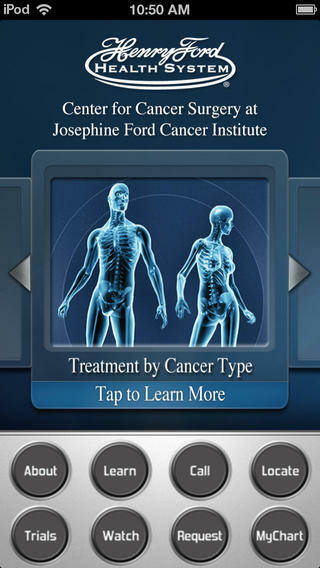 The Josephine Ford Cancer Institute built a smartphone and tablet app (for Android and Apple devices) that allows cancer patients to schedule appointments, but it also features tools like a video library and information on treatment options by cancer type for those who are not patients at the hospital. Other facilities provide more unique features. For example, the Rex Cancer Center app (for Android and Apple smartphones) lets users create a daily log for pain and other symptoms, virtual tours of the center and a virtual wig sampler for chemotherapy patients. 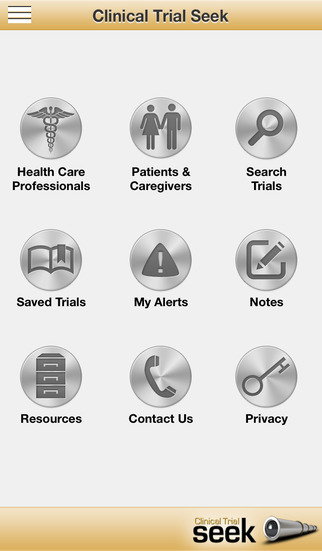 For patients looking for new treatment options, they can download the Clinical Trial Seek app. Users can find trials administered by the National Institute of Health Database and search by disease type, location, trial phase and sponsors. It also lets you save searches to a favorites file. 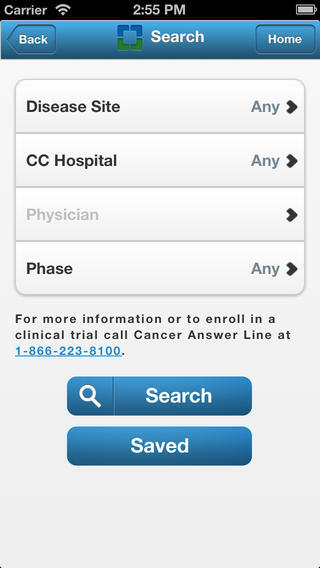 The Cleveland Clinic offers a suite of different apps, but their cancer clinical trials app shows more than 130 different active cancer trials across their health care system. That’s a particularly good feature for late-stage mesothelioma patients interested in participating in any type of experimental treatments. While some health care systems build apps for their own hospitals and patients, other organizations have developed more specific applications for those diagnosed with asbestos-related illnesses. 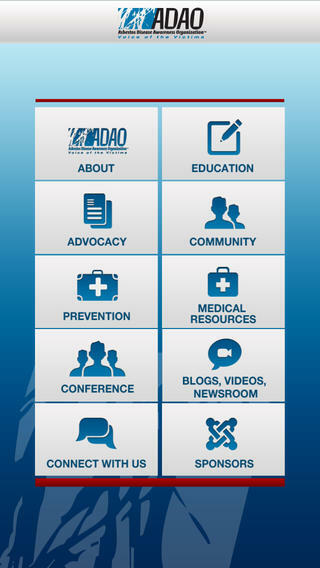 The Asbestos Disease Awareness Organization (ADAO), a nonprofit group founded by asbestos victims and their families, and committed to preventing asbestos-related disease, created an iPhone app with information about avoiding asbestos exposure and receiving mesothelioma treatment. The organization’s app features one-touch dialing to government agencies, including the Environmental Protection Agency, Occupational Safety and Health Administration and the Consumer Product Safety Commission, so users can ask questions and report asbestos-related problems. Finding the right app for you or your loved one can be challenging because there are many apps available in the iTunes App Store and Google Play that could help any cancer patient. A good start is taking advantage of free apps. Some of these free applications feature symptom trackers, information on health insurance and social media options. Cancer.Net: Developed by the American Society of Clinical Oncology. It lets users save information about prescriptions, including photos of labels and bottles; a symptom tracker, guides to 120 types of cancer and sample questions to ask your physician. Check out their iPhone, iPad and Android versions here. Pocket Cancer Care Guide: Developed by the National Coalition for Cancer Survivorship. Allows users to record answers from doctors and nurses, link appointments to calendar and a glossary of medical terminology, a useful tool when trying to decipher complicated terms. Check out their iPhone and iPad versions here. Create to Heal: Developed by the Women Wings Create to Heal program. While cancer takes a toll on the body and the mind, this app uses the healing power of creativity to relieve stress during long treatment and recovery hours. Play music and explore art, color, meditation and creative writing tools. Check out their iPhone and iPad versions here. My PearlPoint Cancer Side Effects Helper: Developed by PearlPoint Cancer Support. Coping with side effects is overwhelming. With this app, users learn about what is causing side effects and how to minimize discomfort. Understanding why your body is reacting a certain way and finding a measure of physical relief are valuable tools for improving day-to-day living. Check out their iPhone, iPad and Android versions here. Chemo Brain Doc Notes FREE: Developed by a cancer patient and the CrowdCare Foundation Inc. 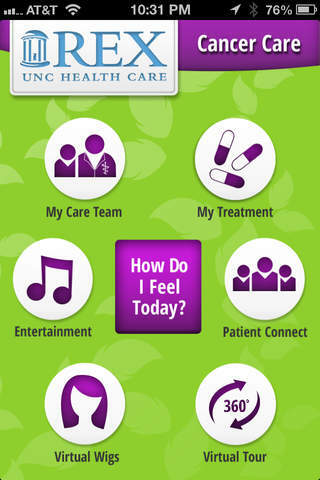 It helps patients organize and manage treatment information. Going through radiation often leads to frustrating thinking and memory problems. This app provides clarity. 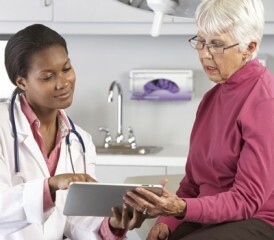 One unique feature is the ability to record and play back doctor visits. Check out their iPhone, iPad and Android versions here. There are many apps to explore and find what is most useful for you. Use these resources to research your diagnosis, become an expert on treatment options, make something new with a creative writing activity or connect with others.